NEW Version 2.2a CD with 700+ Northern Lights images. Professionally printed Signed CD Artwork. Visit the Aurora Gallery to order. 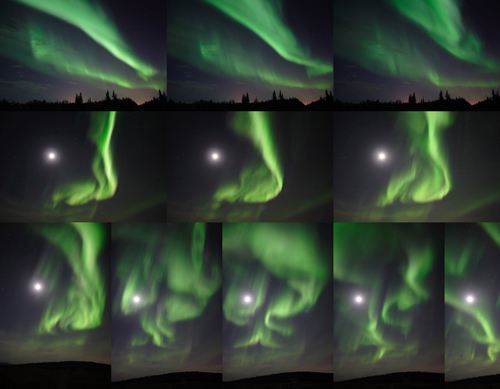 An assortment of original Aurora Borealis (The Northern Lights) images captured in North Pole, Alaska and Interior Alaska. The images are near scientific quality captured with the latest night sensitive lenses, high resolution camera, and with little or no Photo Shop manipulation. If you have never personally experienced this celestial phenomena the photographs you are about to view representations authentic and precise reproductions of this awe-inspiring natural light show - exactly as viewed on a cold Alaskan night. Ice Art images of commissioned local Alaskan artists who carve slogans and figures at business entrances each winter. Includes entries from the International Ice Carving Festival (IICF) held each March in Fairbanks Alaska with dozens of teams from all over the globe competing around the clock in one block and multi-block timed competition. A portion of each Ice Art print sale from the competition is donated to the IICF. Nature Photography and Landscapes, Alaskan Wildflowers, Domestic Flowers. Images of Alaska new and old. From Polar Bears to Caribou - a select viewing of new and original images of Alaskan wildlife - taken from all over the state. Images are updated quarterly.